Twin NASA satellites designed to probe and predict changes in Earth's radiation belts arrived at the Kennedy Space Center on Tuesday, ready to begin several months of testing and assembly before lifting off on an Atlas 5 rocket in August. Riding inside a U.S. military cargo plane from Maryland, the twin spacecraft touched down at the spaceport's runway at 7:54 a.m. EDT (1154 GMT) Tuesday, according to George Diller, a NASA spokesperson. Built at Johns Hopkins University's Applied Physics Laboratory in Laurel, Md., the satellites will investigate what causes the donut-shaped radiation belts surrounding Earth to expand and contract as solar storms erupt and propagate through space. The Radiation Belt Storm Probes are due for launch Aug. 23 aboard a United Launch Alliance Atlas 5 rocket. The $530 million mission is scheduled to last at least two years. Between now and launch, engineers will install solar panels on each satellite, test each spacecraft's systems, fill their tanks with propellant and encapsule the eight-sided vehicles inside the Atlas payload fairing. The satellites will be prepared for launch at the commercial Astrotech processing facility near KSC. The spacecraft will fly through the inner and outer Van Allen radiation belts, named for their discoverer, James Van Allen, who was lead scientist for the first U.S. satellite to reach orbit - Explorer 1. "It's important to us here on Earth because the radiation belts are home to a whole host of satellites that we rely upon," said Nicky Fox, RBSP's deputy project scientist at APL. 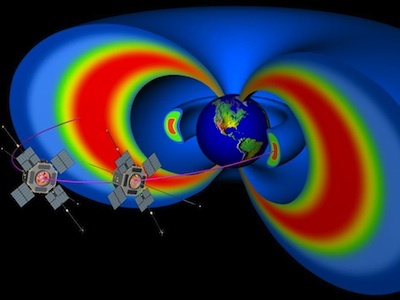 "Geosynchronous orbit, for example, lies within the radiation belts. You actually have these space weather events that do cause the radiation belts to get bigger and hotter, and it can cause anomalies on spacecraft. The same processes at work in the radiation belts are also causing related space weather phenomena like the auroras, which is going to cause currents to flow down to the ground. That can cause problems for power grids, and it can affect the ionosphere's ability to reflect radio signals." Despite their discovery in the 1950s, the radiation belts are not well understood by scientists. Physicists learned in the 1990s the belts are not as stable as once thought. Instead, they expand, heat up, and contract when charged particles from solar eruptions reach Earth. "You can have three large coronal mass ejections from the sun looking like they're identical," Fox said. "One can cause the radiation belts to pump up, get very hot and very big. Another can actually have no real effect on them at all. And another can make them get smaller and less energetic, and yet if you were looking at just the solar signatures, you could think the three phenomena were the same." Not only will RBSP try to uncover why the belts respond differently to each solar storm, but data collected by the satellites could lead to predictions of when radiation fluxes will grow around Earth, giving satellite operators and astronauts warning before potential danger arrives. The Atlas 5 rocket will inject the satellites into a highly elliptical equatorial orbit. The craft will later adjust their trajectories to enter slightly different orbits stretching from 375 miles high to an altitude of nearly 19,000 miles. "We have two spacecraft heading up to the radiation belts," Fox said. "They are going to cut through both the inner belt and outer belt, so they will be looking at all the particle populations trapped there. The inner belt is primarily high-energy protons, [and it's] considered to be relatively stable. The outer belt is extremely dynamic, mostly made of electrons, and it changes dramatically in response to the weather coming toward us from the sun." Full science operations will begin about two months after launch. 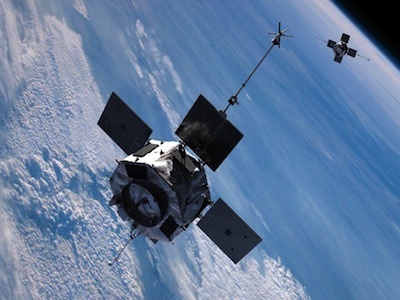 Two satellite are necessary to sample the radiation belts simultaneously from different locations. The tandem mission also allows the satellites to pass through stormy regions of space weather more often. "If you only have one spacecraft, it would pass through a feature, and you would have to wait nine hours to come through it again, and you wouldn't really know if it had changed in time or if it changed in space," Fox said. "By having the two spacecraft come through relatively close together, you can actually start to distinguish those two phenomena." Each satellite carries an identical suite of magnetometers, plasma and particle detectors, and electric field sensors.